Understanding the socio-economic implications of marine litter in the Adriatic-Ionian macroregion. Vlachogianni Th. IPA-Adriatic DeFishGear project and MIO-ECSDE, 2017. Although marine litter has received increasing attention in recent years, few studies have explored its socio-economic impacts. 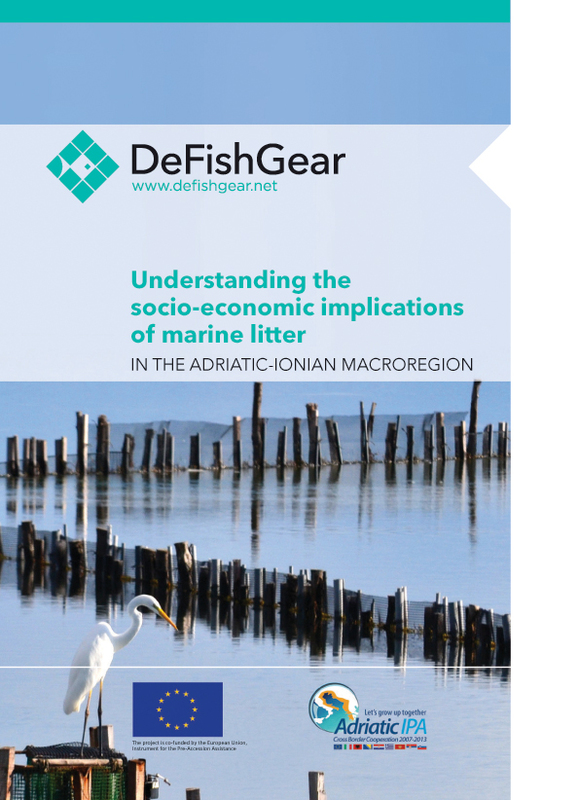 Within the framework of the 3-year long IPA-Adriatic funded DeFishGear project a survey-based assessment of the socio-economic implications of marine litter was carried out in the seven countries sharing the Adriatic and Ionian Seas. The assessment report was the end result of 6-month-long surveys carried out in all countries of the Adriatic-Ionian macroregion. A total of 548 out of 1480 targeted respondents filled in the questionnaires representing an average response rate of 37%. The report clearly demonstrates that the increased costs and potential losses of revenue associated with marine litter for vital economic sectors such as tourism, fisheries, aquaculture and navigation are considerable, and that they negatively affect individuals, enterprises and local communities. For the fisheries sector the average annual cost of marine litter per vessel reaches € 5,378 (cost of repairs of damages, loss of revenue due to the smaller catch, loss of time spent on clearing and repairing nets, etc., reported by fishermen per fishing vessel per year), an amount much higher than the one reported for EU vessels. Given this, the total losses to the fisheries sector in the Adriatic-Ionian macroregion were calculated to be € 18.19 million per year, which represents one third of the marine litter costs to the EU fishing fleet (€ 61.7 million per annum). On average, the annual direct and indirect marine litter related costs for the aquaculture sector were assessed to be € 3,228 per aquaculture farm unit. The total annual cost of managing marine litter reported by 38 harbours and marinas in the Adriatic-Ionian macroregion was € 323,550 with an average annual cost of € 8,518 per harbour. The average annual amount per tourism related business of varying size and type was calculated to be € 5,685 per year, which can be considered as a substantial expense. The total cost of removing beach litter reported by the 32 municipalities was € 6,724,530 per year, with an average of € 216,920 per year per municipality. On average, the municipalities spent some 5% of their budget for marine litter cleanup operations. The IPA-Adriatic funded DeFishGear was a 3-year long project piloting coordinated and harmonized actions on the science-policy-society interface for litter-free Adriatic and Ionian Seas. This is the first-ever effort aiming to investigate in a coordinated, consistent and comprehensive way the socio-economic implications of marine litter in the Adriatic-Ionian macroregion. In fact it is the first of its kind marine litter related study in the Mediterranean.